This show is awesome, make more of them like this. Fighting, check. Blood, check. Good Animation, check. A Plot that makes little sense, but you really don't care, check. No need for feelings, check. Swords, check. Samurai, check. Glasses, check. Army girls, check. Meat, check. Will you watch this, check. So I very rarely review the animes I watch because I tend to watch ones that have been out for a while. But this is one of the few times where I watch one as it's airing because it managed to completely hook me from the beginning. 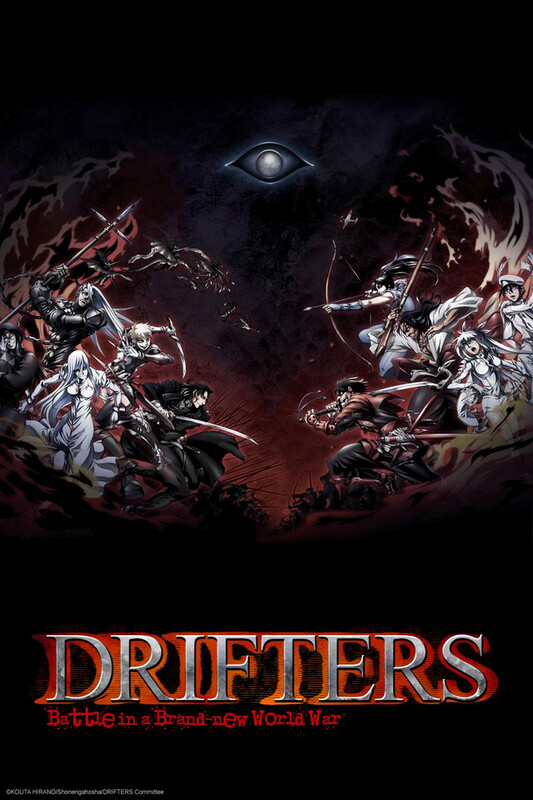 Now, maybe I'm just a sucker for history of warfare, fantasy, and the whole 'modern age vs ancient times' scenarios that you really only see in long games of Civilization, but Drifters caught my attention the moment I heard about it. To sum up, it's an anime where historical figures, specifically ones that served in war or were related to combat in some way, who are saved moments before death and then transported to an alternate world. These individuals are known as 'Drifters,' hence the title of the show. Did I also mention the original manga was written by the same man who did Hellsing? The show opens during the Battle of Sekigahara in 1600 and follows our main character, Shimazu Toyohisa in the final battle of his life. He somehow survives, but receives many mortal wounds that he would eventually succumb to, were he not rescued by a mysterious man and sent to the alternate world, where he becomes a drifter. Once there, he is healed up by two other Drifters, and he attempts to settle into and understand this new world. So that's a brief synopsis of the first episode. At the time of writing this there are only three out, but I'm willing to say that this anime is probably going to be one of the best of this season. The art style is fluid and very similar to that of Hellsing: Ultimate, the characters are very interesting (but again, I'm a sucker for history so take it with a grain of salt), and overall just seems very promising. If I were to compare it to a popular anime someone might recognize, I'd probably compare it to the Fate/Stay series in terms of the basic premise. In terms of quality, that comparison remains to be seen, but I'm pretty confident it'll live up to it. Either way, if you're a fan of the Fate/Stay series, I'd give this one a look. Same with fans of Hellsing. Or just fans of violent, dark animes in general. Blood, combat, and more blood. You can expect a lot of gritty combat in this one. This will clearly be a tale of bloody warfare involving heroes and warriors gathered from across time. The animation and artwork are solid and have their own feel. If you like heroic samurai combat this one will grab you right away. Not for the squeamish. So Glad The Creater of Hellsing is Back! This show is great and really fills the empty part in my heart for blood, gore and awesome fighting scenes. The art style is something I have always loved about Kouta Hirano since Hellsing came out. Speaking of Hellsing, parts of this series often times remind me of it which also makes me gives this show even more props. In making another juxtaposition of the two works, Drifters has its funny moments and animation which help space out the carnage that occurs.The story is pretty interesting especially with the mystery of the identity of the Black King. Of course this series isn't done yet but as long as the story has an ending that doesn't infuriate me then this show will stay at a solid 5 star for me. The art style is very iconic to the hellsing franchise, which this anime is coming from the creators of hellsing. Very old school. Still very effective and very distinguished. The artstyle for the backgrounds is gorgeous. The comedic moments are a tad offsetting due to the backgrounds, but overall seem to fit the anime fairly well in a sense. There has been only a tad bit of character development and we can only predict what this is going to be about from the first episode, but from what I can see it is similar to the anime "Gate," but with a much more serious feel. The characters are very unique and the history that is being portrayed provides a lot of references which is a strong point for the anime. Definitely going to give this a shot, but artstyle may not be for everyone since it is pretty oldschool. Definitely need more context, but certainly grabbed my attention from the first episode. New to the series, not disappointed! Was recommended by a friend to check this out, and all I can say is I'm thoroughly impressed! The art style is phenomenal, and the ties to historical characters throughout the ages is always a good way to draw someone in. Despite being totally unfamiliar with the series, introducing Nobunaga early drew me right in, and the shady dude at the desk already leaves me with a ton of unanswered questions. Looking forward to more episodes!